Green Works/Vermont Nursery & Landscape Association would like to invite you to exhibit at our Annual Winter Meeting and Trade Show on Thursday, February 15, 2018. 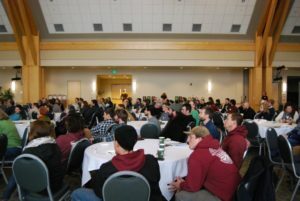 The meeting will be held at the University of Vermont-Davis Center, US Route 2/Main Street/Williston Road, Burlington, VT. We expect 100-150 attendees to visit our Winter Meeting & Trade Show and have set aside time throughout the day for attendees to visit exhibitors. Exhibitor registration includes full meeting attendance for one representative and includes morning refreshments, lunch, and admission to the educational seminars. Each registered exhibitor will be provided a 6’ skirted banquet table. The meeting begins at 8:00 a.m. and ends at approximately 4:00 p.m. Please complete the enclosed registration form and return it to the Green Works/VNLA office by January 31, 2018. Our keynote speaker will be Thomas Rainer of Phyto Studio, Washington, DC. Thomas is a registered landscape architect, teacher, and author living in Arlington, Virginia. Thomas, a leading voice in ecological landscape design, has designed landscapes for the U.S. Capitol grounds, the Martin Luther King, Jr. Memorial, and The New York Botanical Garden, as well as over 100 gardens from Maine to Florida. He is a celebrated public speaker who has garnered acclaim for his passionate presentations to audiences across the U.S. and in Europe. Thomas serves as a Principal for the landscape architectural firm Phyto Studio in Washington, D.C. with Claudia West and Melissa Rainer. 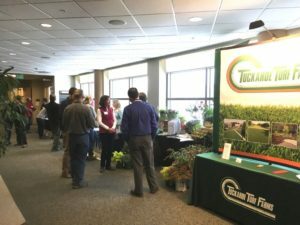 Other presentations during the day will include the Green Works Industry Award winner presentations, a business roundtable forum, an update on pests and diseases (earns 1 pesticide credit), and a presentation from Peter van Berkum of van Berkum Nurseries on growing/selling native plants. SET-UP: Set-up time is between 6:30 am – 8 am Tuesday morning. Once you register we will email you a vendor information form with specifics regarding move-in and set-up.. Registration for attendees begins at 8 am. The DoubleTree by Hilton Burlington is located at 1117 Williston Road, S. Burlington, VT 05403. Other hotels in the area include the Holiday Inn – 800-315.2605; and the Sheraton Hotel – 802-865-6600. To register for this event and make payment online, please use the add to cart buttons below. Please enter the attendee’s name. If you need to register more than 1 person, please add each to the cart individually.